In the arid lands covering Uzbekistan, furrow irrigation with low application efficiency is still widely used due to a lack of funds and shortage of labor. To save water and prevent secondary salinization caused by excessive irrigation, it is important to adopt low-cost and easy water-saving irrigation methods. Onishi et al. (2017) proposed simplified surge flow (SF) irrigation that does not require expensive equipment and merely divides the water supply into two phases at 1-day intervals. 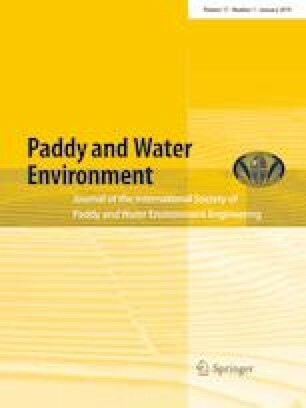 This study investigated the suitable inflow rate and furrow length of simplified SF to improve water application efficiency in Uzbekistan. Five experimental plots (total area of 2,250 m2, with 25 furrows) were set up, and the inflow rates for two plots were 5 Ls−1 (F5.0) and that for the others were 1.7 Ls−1 (F1.7). The conventional irrigation method (F5.0C and F1.7C) and simplified SF (F5.0S and F1.7S) were applied to cases of furrow length of 100 m under each inflow rate. In addition, simplified SF was applied on a 50-m furrow at F1.7 (F1.7S-50). In the first irrigation using simplified SF, water was supplied from the start point of the furrow (0 m) for half of the furrow length (50 m, 25 m). In the second irrigation, water was supplied from the start point to the end of the furrow (100 m, 50 m). The application efficiency in F1.7S and F1.7S-50 was higher than that in F1.7C and F1.7C-50, and the highest was in F1.7S-50. The water supply duration was shorter in F5.0S, but the total volume of supplied water was larger than that of F1.7C. These results indicate that shortening furrow length might be an effective way to save water using simplified SF with a low inflow rate, and in contrast, that it is necessary to extend furrow length with a high inflow rate.